Piotroski isn't your typical Wall Street big shot. In fact, he's not even a professional investor. He's a good old numbers-crunching accountant and college professor. 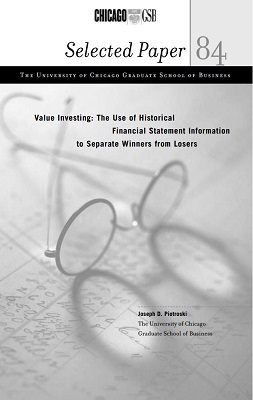 But in 2000, shortly after he started teaching at the University of Chicago's Graduate School of Business, Piotroski published a groundbreaking paper in the Journal of Accounting Research entitled "Value Investing: The Use of Historical Financial Statement Information to Separate Winners from Losers". In it, Piotroski laid out an accounting-based stock-selection/shorting method that produced a 23 percent average annual back-tested return from 1976 through 1996 -- more than double the S&P 500's gain during that time. Piotroski's findings were reported in major financial publiations like SmartMoney. Today, he teaches accounting at Stanford University's Graduate School of Business. Since 2004, this portfolio has returned 155.4%, outperforming the market by 1.7% using its optimal annual rebalancing period and 20 stock portfolio size. Validea used the investment strategy outlined in the paper Value Investing written by Joseph Piotroski to create our Book/Market Investor portfolio. Piotroski's methodology starts by narrowing stock choices to those trading in the top 20 percent of the market based on their book/market ratios (or, conversely, the bottom 20 percent of the market based on price/book ratios). He found that just buying low price/book stocks does not produce excess returns over the long term, because many low price/book companies are trading at a discount because they deserve to -- they're dogs with poor prospects. When he applied a series of additional tests of financial strength to these low price/book stocks, however, Piotroski was able to separate the dogs from the good prospects. Among the variables he examined: return on assets, current ratio, cash flow from operations, change in gross margin, and change in asset turnover. The strategy usually finds smaller companies whose stocks are flying under Wall Street's radar.